Hi everyone! I recently wrote a guest post for the lovely charlotte from lilmisschickas (LINK) while she was away in Disney Land (lucky thing!) discussing my favourite and most used hair products and just in case you missed it over there, I thought I'd pop it up on my own blog too. My hair is something I always get asked about so here are my staple products that I use on a regular basis to keep it healthy and happy! If you use heat on your hair, no matter how often, its so important to use a good heat protector. This Straight & Smooth spray from ghd is brilliant as it protects the hair from damage as well as helping to banish fly-aways and frizz. It only takes seconds to spritz it all over my hair before I blow-dry it and I see a huge difference in the finished result of my hair after using it. Ah Moroccan oil, the cult hair product amongst most bloggers. If you've never tried this glass bottle of wonder, you need to, NOW. Seriously, this stuff has transformed the condition of my hair. For reference my hair is bleach with blonde highlights so its very prone to dryness. Before I started using this product, nothing would help my hair feel soft, smooth and healthy. However, since applying one pump of this to my hair each time I wash it (around three times a week), my hair has never been so healthy. I can honestly say my hair now feels silky soft and is so shiny that you'd never know I've abused it for years with bleach. Its also helped my hair grow a LOT too. I'm now the proud owner of hair thats almost down to my waist, something I never thought I'd achieve. When I'm having a pamper in the bath, I love nothing more than treating my hair to a mask. I don't have time to do them quite as often as I'd like but when I do get chance, I slather one all over my hair and relax. However, other than being a great sidekick for bath times, they also work wonders at giving hair a deep condition. When my hairs feeling particularly rubbish, I know a good hair mask will give it what it needs to feel good again. This one from Macadamia contains macadamia oil (who'd of guessed it) which nourishes the hair, improves elasticity and adds shine. My hair is much easier to manage after using this product and silky soft too. Its also the most beautiful scented hair product I've ever used - it smells good enough to eat. If you want to get your hair in good condition but haven't got time to apply masks, treatments and a whole host of other lotions and potions, then this convenient spray will be perfect for you. Ideal for someone with a busy lifestyle (like me), this leave-in conditioner can be spritzed over wet or dry hair within a matter of seconds and left to work its magic. I tend to spray it on my hair most evenings before bed to give my hair an extra bit of nourishment and prevent it from drying out. This one is designed specifically for blondes but I'm sure John Frieda do one for all hair types too so make sure you check it out when your next passing by Boots or Superdrug. Its super affordable and smells amazing too. If like me you're a fan of big bouncy hair, you must give this product a try. Its designed to give the hair an extra bit of 'oomph' around the crown and when sprayed onto my roots and teased with a backcombing brush, it helps to keep my hair in place and provide long lasting volume. I don't use it every day purely because it would cause a build-up and require me to wash my hair more frequently but for nights out when you want a bit of extra glamour, its fabulous. So there we have it, my top five hair products that help keep my hair in tip-top condition and looking its best at all times. I really hope you enjoyed finding out a little bit more about each of them and have maybe found something new to try. Have you tried any of these products? 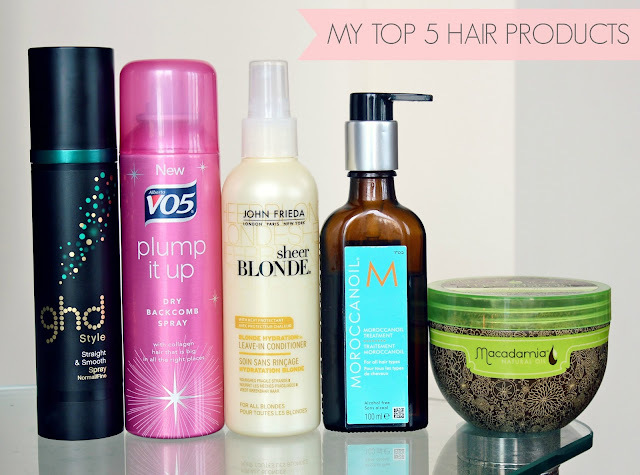 What are your favourite hair products? I might try out the John Frieda one whilst I recuperate this month. For masks right now i'm actually really enjoying the Herbal Essences Bee Strong One. It smells so yummy! I'm in love with any kind of hair oil. My favourite one so far is the Amargan Hair Therapy Oil but I'm very keen to try the Moroccan Oil as well. I've just ran out of Moroccan Oil and I was desperate to get my hands on some more of it but as it's a bit pricey I think I'll try the John Freida leave in conditioner for a bit instead! :) Thanks for sharing! I desperately want to try Moroccan oil, that Macadamia mask looks lovely too! Gosh I really want to try that backcombing spray now! Ooh I really want to try Moroccan oil, sounds perfect for my dry hair. I really want to try the moroccon oil and the macadamia products! Ahhh you and your Moroccan oil! Haha I still really need to try it! I'm desperate to grow my hair longer so since you mentioned that Moroccan oil helps with that, I've gone out and bought some. So thanks for the tip! The Macadamia Masque sounds lovely! I would like to use Moroccan oil on my hair. I have heard its really good for the hair. I love the moraccon oil! I really want to try the macadamia products! One of my favourites is Batiste dry shampoo, but I would love to try Moroccan Oil! Love the Macadamia hair products, especially their hair oil. My hair is practically dead from the amount I have dyed it so desperately need some form of hair routine! Will be looking into these! Especially the hair masque! 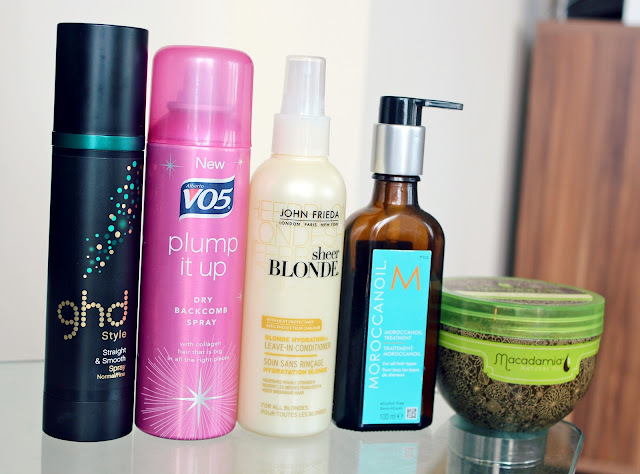 I haven't tried any of these products but the spray in leave in conditioner is right up my alley! I'll definitely be looking into it. This post was really helpful, thank you! Great selection of products Kayleigh! I love Moroccanoil - it really does do wonders for hair that needs a bit of TLC. I haven't seen the Vo5 Backcomb Spray before, however it looks fantastic. I'll definitely be keeping my eyes open for it in stores. For a list of really great winter hair treatments, visit http://bit.ly/12m7M4S. Moroccan Oil sounds like a life saver, I need to try it! I've recently purchased some VO5 products that help with back combing and voluminising hair so I definitely will look into buying the spray that you talk about, thanks. 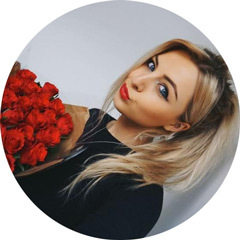 You post is full of complete quality and informative, I am daily reader of your blog and spend the lots of time with it. I like the way you shared such a nice post, well done & keep it up.